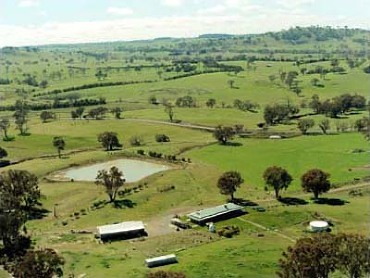 In 1997 as Bob was retiring from the full-time Air Force he and Judy chose a newly sub-divided 48 hectare (120 acres) sheep property near Yass, built a large and comfortable home, sheds, fences, yards, alpaca shelters and 10 km of fencing and yards – and thought that life would then be easier and more relaxed! As a long-time Secretary of the local Landcare Group active in encouraging landholders to participate in Rivercare and Landcare projects, at Argyle Park Bob has set out to demonstrate some important land care principles. The Group’s own native tree seeder is maintained at Argyle Park, and has been used successfully to seed hundreds of thousands of eucalypts, wattles and other native species throughout the property. The first seedings from 1998 and 1999 are now up to 10 metres high, and with the benefit of the longer root structure growing from seed almost all have survived the 2002/03 drought – although some more recent seedings didn’t fare so well. The latter were re-seeded in Spring 2003, again using the ‘Boorowa mix’ of some 45 species developed by John Wetherstone of Gunning. 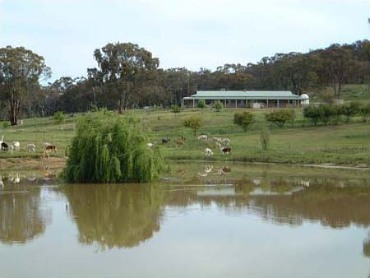 ‘The Park’ between ‘Lake Argyle’ and the homestead has been planted with many deciduous trees and shrubs to reduce the risk of fire near the house and alpaca yards. This also helps to eliminate roof and water contamination from leaf litter. Care has been taken in all plantings to avoid poisonous species, so that all stock can graze freely when required. 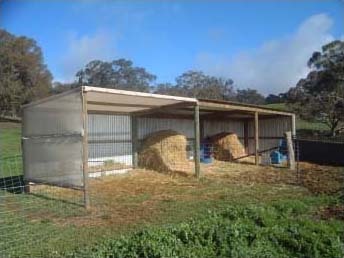 Yards capable of handling up to 3-400 alpacas have been built, together with a large general purpose shed with a unique cork tile shearing floor that is very easy to keep clean. All fencing has been carefully planned to provide funnel features and lane-ways so that alpacas can be easily moved and yarded by one person. Another planned feature is several small north-facing elevated paddocks that can be seen from the homestead, making it easy to observe alpacas near to and after birth. These paddocks also have shelters and simple yards suitable both for general shelter and supplementary feeding, and for confining a few animals for birthing and post-birth procedures if necessary. So with about 10 ML in the Lake, 125,000 litres of rainwater in the main tank for domestic use, Argyle Park is as nearly drought-proof as it’s possible to be in southern New South Wales. The property also enjoys good shelter from major storms from the elevated forested areas around its south-west boundary, although this area also shelters up to 1000 Eastern Grey kangaroos at times. We occasionally see as many as 400 of these hopping over the boundary fences to graze on our pastures. Initially the alpacas treated these interlopers with great alarm, but now accept them completely. In late 2010 a 7KW solar power system was installed on the shed roof. This supplies about twice as much power into the electricity grid as is consumed each year, so for a guaranteed 25 years the expectation now is "free power, as well as free water with NO restrictions for all needs regardless of droughts, no sewerage or water rates, unlimited vegetable and some fruit supply, and (nearly free) roast lamb each week!"